A male house sparrow. The male’s chestnut and black colors, including the black chin and black bib, become brighter in time for the breeding season as the light tips of the feathers seen here wear away during fall and winter. February can bring us the worst of winter (such as minus-10 degree weather), the beginnings of spring (such as 50 degree weather), or a bit of both (as when we get both extremes in the same week). But no matter what this month is like, chances are good that you’ll find house sparrows nearby. The same can be said of all the other months of the year. Thanks to their numbers and their habit of living year-round near people and buildings, house sparrows (Passer domesticus) can be relatively easy to observe as they go about their lives. Sometimes called English sparrows due to their European origins, these little brown birds are often controversial or even unpopular, but they can be fun to watch. We hardly notice house sparrows as they hop around on the ground near picnic tables, hunting for crumbs and dropped food, but they’re more obvious in numbers, as when a flock arrives at a bird feeder and the ground underneath it. They eat seeds year-round, but they also go after insects in the breeding season to get extra protein for egg-laying and feeding chicks. You’re probably familiar with their repetitive but distinctive “cheep, cheep, cheep.” It might come from a bird – probably male – perched on a roof or branch, or from a flock of house sparrows sheltering unseen in a dense bush. If you spent time in a backyard, playground, park, or schoolyard while growing up, their plain, simple “cheep” song was probably part of the background noise to your childhood. At this time of year, as the breeding season approaches, you might spot a house sparrow carrying some grass-like material as it flies to a crevice on a building, or disappears behind a store’s sign or inside a streetlight or utility box. The bird is probably already building or refurbishing a nest. Unlike most of our birds, house sparrows may use their nests throughout the winter as a place to stay warm or spend the night. House sparrows are quite social and often nest near one another, so you might notice comings and goings around a nest area. What is a house sparrow nest like? It’s a bit different from most nests around here. House sparrows typically build a somewhat ball-shaped nest with a messy cup and a roof (as in our photo). They like to nest in protected spaces in buildings or other human structures, so their nests aren’t easy to see. They occasionally nest among bush or tree branches, or in vines on the side of a building. You might even find a nest in a bluebird box, because house sparrows are small enough to enter the 1-1/2 inch hole that keeps larger hole-seeking birds (such as starlings) out. A female house sparrow. Juveniles look similar to females. House sparrows are prolific breeders. The birds in a pair tend to stay together and raise as many as four broods in a season. The female usually lays about five eggs, which the pair incubates for about two weeks. The young stay in the nest for another two weeks, and then leave the nest and follow a parent – often the male – around for a week or so. The female may begin laying eggs again only eight days after the young have left. In late spring or summer, you might wonder what all the fuss is about if you hear a couple of house sparrows carrying on with insistent cheeping for several hours near a nest. You’re probably hearing parent birds encouraging their young to leave the nest. If you find a fluffy little brown bird on the ground in an area with buildings, and the bird doesn’t fly off the way you’d expect, it may be a young house sparrow that has very recently ventured out of its nest. What should you do? It’s best just to leave it alone (and keep pets away). The parent birds are probably nearby, and the fledgling will probably get itself organized to fly up to a safer spot. In any case, late spring and summer usually bring opportunities to watch families of house sparrows foraging together on the ground. You might spot a parent bird popping bits of food into the mouth of one of its recently fledged young (which look as big as the parent). Or you might notice the young sparrows crouching and quivering their wings to beg for food. Once the young sparrows are independent (after a week or two), they tend to flock together with other young sparrows of the season. As summer progresses, flocks of house sparrows become common sights. Adult house sparrows join the flocks later in summer and fall. When a flock shows up at a feeder, watch to see its pecking order or dominance hierarchy in action as more dominant house sparrows chase or take the places of others. You might notice that the males (with black bibs) are dominant to females and juveniles, and that males with larger black bibs are more dominant than males with smaller black bibs. In the breeding season, females may become more dominant, so relationships are less clearcut. 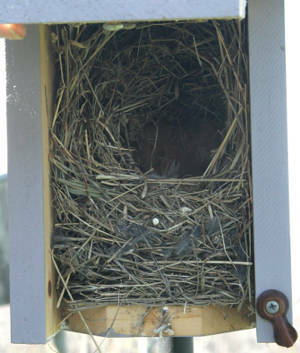 A house sparrow nest with a cup and a roof, inside a bluebird box. Have you ever seen a house sparrows take a dust bath? You’re apt to see this in late summer and fall, when things are dusty. The sparrow crouches in a dusty spot, wiggles, and flaps its wings to fling dust all over itself, often digging a shallow hole in the ground. House sparrows don’t usually migrate, but they do move around locally in flocks, usually within a mile or so of where they hatched. In late fall, established pairs tend to return to their nest sites for the winter. How did we get house sparrows? They’re not closely related to American sparrows. Instead, they have descended from house sparrows from England and Germany that were introduced to this country starting in the 1850s. 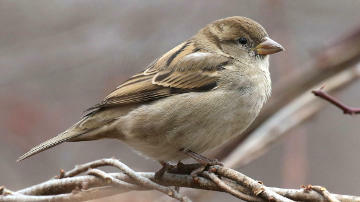 The first 100 house sparrows were introduced in Brooklyn, N.Y., in 1851-1852, but other introductions followed. In Massachusetts, house sparrows were introduced by accident in Boston in 1858, and then again on purpose in 1868-1869, supposedly in hopes of controlling recently introduced gypsy moths and other insect pests. 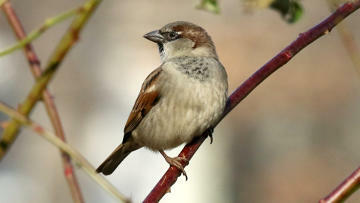 House sparrows took readily to life around towns, cities, and farms – as they’d lived in Europe – and spread quickly. They’ve even adjusted to modern life, with some house sparrows learning to open automatic doors by flying in front of the door’s electric eye. In Massachusetts, house sparrow populations were greatest about a century ago, 1890-1915. They’ve declined since then, probably as farming declined and also became more mechanized and efficient, leaving less grain in fields. Because of pesticides, insects are also less abundant. Between 1966 and 2010, U.S. house sparrow populations declined by 81 percent, according to the North American Breeding Bird Survey. House sparrows are often regarded as an invasive species, and as a non-native species they are not protected under the Federal Migratory Bird Act Treaty (1918). Whether you’re a fan of house sparrows or not, watching them can prepare you to recognize similar behaviors in other birds that you might see.